The information presented on this page was originally released on March 4, 2013. It may not be outdated, but please search our site for more current information. If you plan to quote or reference this information in a publication, please check with the Extension specialist or author before proceeding. Several years ago, a new group of tropical hibiscus exploded onto the market with vibrant and exciting colors -- a Technicolor dream. Thirty-eight fantastic selections of Cajun hibiscus, bred and released by the Dupont Nursery in Louisiana, feature colors ranging from bright yellows to pinks, reds and whites. Some of the more spectacular blossoms are those with color blends and those with bright red eyes. The size of the flowers can be unbelievable; some blooms are wider than nine inches across. One of the most interesting features, especially to plant geeks like myself, is the arrangement of stamens and pistil, which are unusually prominent and colorful. The foliage is dark green and glossy and provides a nice background to display the colorful blooms. One drawback to this plant is that generally the flowers only bloom for a single day. But there is an upside: these plants will produce flowers almost continually from spring until fall frosts. Hibiscus can be planted in the ground or grown in containers. They need plenty of sunlight whether planted in pots or in raised growing beds that have excellent drainage. Cajun hibiscus grow well in containers. Commercial growing mixes of peat and pine bark have been engineered to provide good drainage and should be used in containers with hibiscus. In most Mississippi gardens, Cajun hibiscus will need cold-weather protection. You will have to dig up in-ground plants for the winter. Prune the branches and roots back a bit and pot using good potting mix. In the spring, transplant the hibiscus back into the landscape. This seasonal move is an easier task if hibiscus plants are grown in containers that can be moved indoors before temperatures fall below freezing. Every year or so, these container plants will need to be repotted. Either transplant them into a slightly larger container or prune the branches and roots back by about one third and replant in the original container. To have the best-looking hibiscus, be sure the plants do not go through periods of drought. It’s also important the root systems are not water logged, especially in containers, where root rot can cause problems. These plants need to have consistent and even watering to maintain the gorgeous flowers. The watering needs will vary with the season; plants will need more water in hot weather and less in the cooler months. Over- or under-watering can cause buds to drop before the flowers open fully. Don’t rely on fertilizing just once a season. 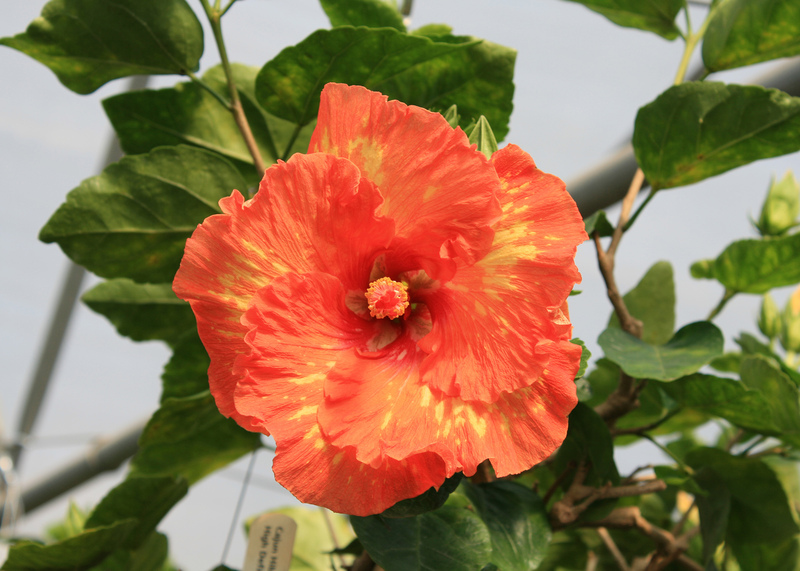 Cajun hibiscus need a readily available supply of nutrients and like monthly feedings. Granular or slow-release fertilizers can release nutrients with watering and irrigation. Most gardeners will find it easier to use water-soluble fertilizers and feed during normal watering. Be sure to use fertilizers that are low in phosphorus, as hibiscus need only small amounts for normal growth and flowering. 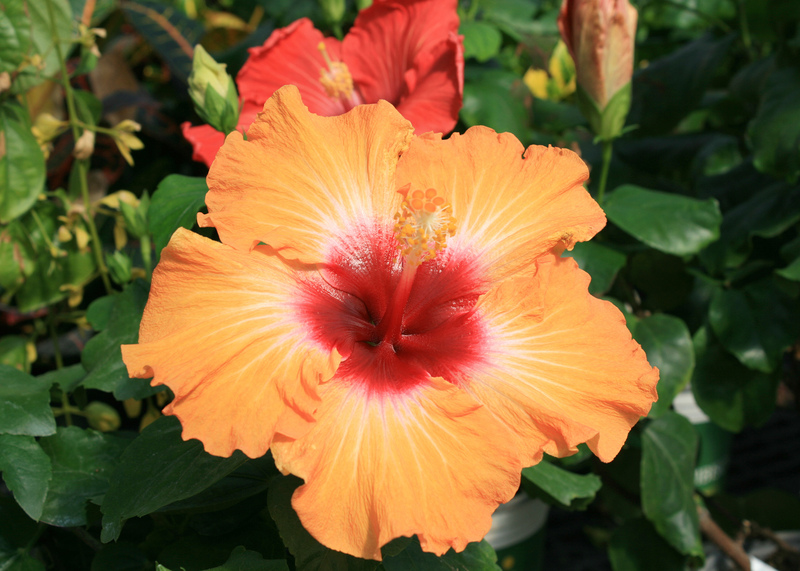 Cajun hibiscus are perfect for adding a tropical flair on a porch or patio. Combine these gorgeous blooms with other tropical plants, such as bananas and canna, which require similar care and management.